L. H. Tsutsumi and D. Oishi. 2011. Specialty Crops for Pacific Island Agroforestry Farm and Forest Production and Marketing Profile: Honey bees. 29pp. Tsutsumi, L. H. 2011. Inspecting a Hive. UHH Publication. Tsutsumi, L. H. 2011. Beekeeping Equipment and Clothing. UH Hilo Publication. Tsutsumi, L. H. 2011. Honey: Questions and Answers. UH Hilo Publication. Tsutsumi, L. H. R. Short, D. Macanas. 2009. Bee hive stand for ground based Little Fire Ant (LFA) Control. UH Hilo Publication. Tsutsumi, L. H., D. Oliva, J. Sanchez, M. Tsutsumi. 2007. More, Please. UH Hilo Publication. Tsutsumi, L. H., D. Oliva, J. Sanchez, M. Tsutsumi. 2006. A honey of a meal. UH Hilo Publication. Tsutsumi, L. H. 2005. Lava bee products. UH Hilo Publication. Tsutsumi, L. H. 2000. 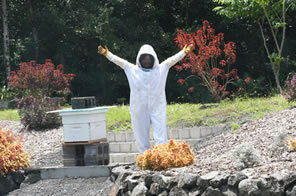 Queen rearing in East Hawai’i. J. Hawaiʻi. Pac. Agric. 11:45-50. Roddy, R. M. and L. H. Tsutsumi. 1997. A history of honey bees in the Hawaiian Islands. J. Hawaiʻi. Pac. Agric. 8:59-70. Development of a Bee Friendly Sustainable Educational Garden. Located at the UH Hilo/CAFNRM farm in Panaʻewa, Hawaiʻi, the garden named Mapuhonehone referring to the wafting fragrance of honey, was started in summer of 2010. The educational garden features bee friendly plants and promotes the importance of honey bee in agriculture. This garden has been showcased to public and private groups since its inception and was most recently part of an open bee event at the farm on March 10, 2012 called “Bee-coming Sustainable”. Development of Value-Added Bee Products. These products showcase the honey and wax extracted by UH Hilo beekeeping students from bee hives at the UH Hilo farm. In conjunction with the UH marketing division, several of these products are currently being sold under the Kulanui brand at UH stores with future plans to expand the line. Brochures and online video promotions are available for viewing on the UH Rainbowtique website. Monies generated from the sales of these products help to support UH students. Chef Alan Wong collaborated with UH Hilo to create the Adopt-A-Beehive with Alan Wong program to stimulate public awareness through an educational setting about the importance of honeybees. The program was first piloted in 2010. In 2011 the program was unveiled and currently UH Hilo beekeeping students learn about beekeeping while tending to “adopted” hives. Student letters update the adopters about their hive and there is a shared learning experience between students and adopters. Additionally, the program has already sponsored three $1000.00 scholarships. More information on the program can be found on the UH foundation, Alan Wong, UH Hilo/CAFNRM websites.